Intuitive, integrated documentation software designed by therapists for use in therapy practices. Clinical documentation and reporting has never been quicker, easier or more comprehensive. From evaluations and daily SOAP notes to audit-ready records, ClinicSource therapy documentation software empowers you to be a more productive and thorough provider. Customized reporting templates for pediatric and adult patients, organized by specific therapy disciplines: Speech Therapy (ST), Occupational Therapy (OT), Physical Therapy (PT) Mental Health (MH), Massage Therapy (MT) and Applied Behavior Analysis (ABA). Intuitive platform streamlines documentation. Once each therapist has selected a discipline, ClinicSource therapy documentation software automatically focuses on options relevant to that discipline, making it easier to find what you’re looking for. Plus, you can add any new discipline you want. 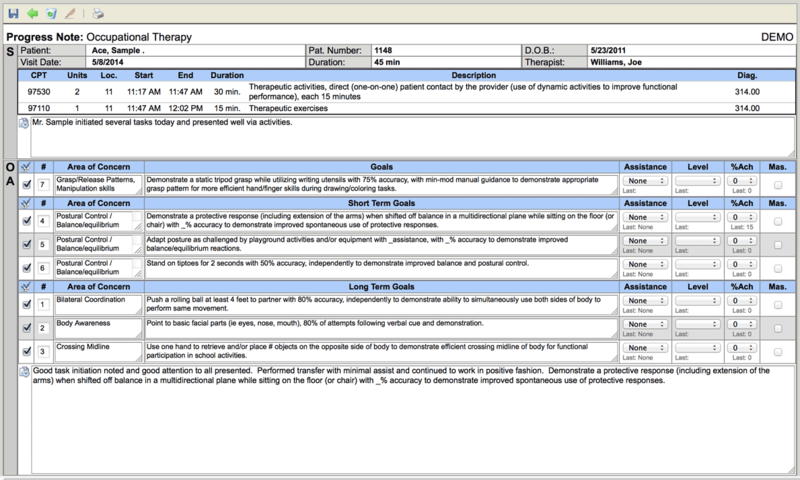 Therapist-developed Treatment Log simplifies and streamlines session recording. Relevant diagnosis codes, CPT and G-codes are pre-programmed for easy selection. And automatic reporting reminders help keep all of your reporting on track. 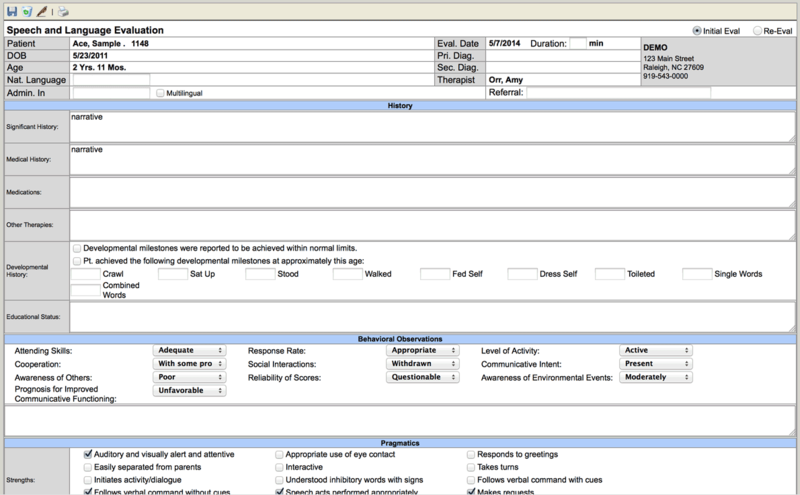 Care plan templates feature modalities, procedures and goals specific to your discipline. The exclusive Goal Library comes pre-populated with hundreds of relevant objectives. Once selected, they automatically flow through to the patient’s daily notes—no need to re-type. SOAP notes software templates, goals populated from the care plan, and goal assistance level, type, and achievement percentage drop-downs make it easy to report on daily progress. Progress note summaries and discharge summaries let you quickly track patient progression, including at what percentage each goal was accomplished, and to what degree. Automatically-updating therapy documentation software keeps your practice up-to-date on new requirements, and helps you satisfy reporting obligations. In the event of an audit, all documentation is already organized and ready to print or deliver electronically. ClinicSource documentation software makes all of your therapy practice documentation quick and easy, giving you more freedom to focus on patient care. And the therapy notes software is completely web-based, so you can create and access all documentation from anywhere.